The Mall gets a much-needed overhaul. In 2003, Congress declared the Mall “a substantially completed work of civic art.” So when the National Museum of African American History and Culture opens next year, that’s it: no new monuments or museums on the Mall’s main stretch. One reason is the woeful condition of the grounds. Trodden by more than 25 million visitors a year and lacking basic amenities, they need both TLC and updating. Three areas will get major overhauls by 2050—provided private donors are found to help cover several billion dollars’ worth of costs. The Castle would still be a visitor center, but BIG would expand it underground and bathe it in daylight from above. The firm also proposes an underground extension at the Hirshhorn Museum and Sculpture Garden and would lower the walls that appear to cut it off from its neighbors. 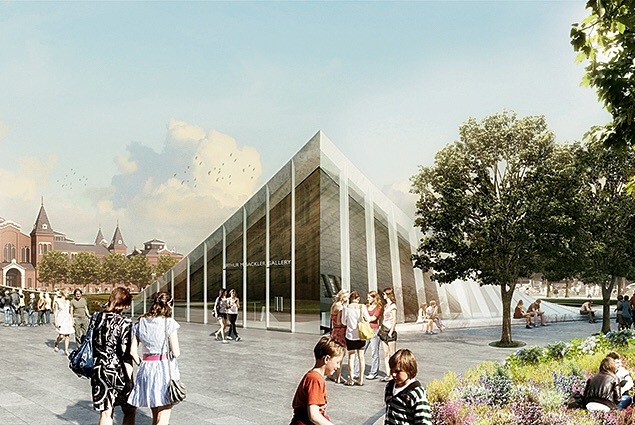 The aboveground entrances for the Arthur M. Sackler Gallery and the National Museum of African Art would be removed, and the new courtyard would peel up at the corners like a giant sticker, forming angled glass entrances pouring natural light into the exhibit spaces below. It couldn’t be more different from the Enid A. Haupt Garden, installed in 1987, which many Washingtonians love. Still, the glass “moat” around the new green would better link it to the museums below, and entrances would be more visible. The plan must go through federal reviews. Constitution Gardens, just north of the Reflecting Pool, is known for its crumbling sidewalks and stagnant lake, but a rehabilitation gets under way this summer when the nonprofit Trust for the National Mall begins the first of several improvements led by Rogers Partners and PWP Landscape Architecture. The Trust also hopes to rebuild Sylvan Grove, the land to the south of the Washington Monument, with a striking plan by the design firms Olin and Weiss/Manfredi. By 2050, if not well before, the gardens should be a popular destination for walks, picnics, and ice skating—assuming the Trust can raise the $159 million it needs. The open, lattice-like pavilion of the gardens, which will include a restaurant, is designed to sit lightly on the ground and frame views. The Trust will bring the lake back to ecological health, putting a wetland around its perimeter to help clean the water, and will build a 160-foot-long pavilion at the east end. The project has received unanimous approval from the two federal bodies that weigh all proposed changes to the Mall. Southeast of Constitution Gardens, the Trust plans to reshape land near the Washington Monument by replacing the wooded Sylvan Theater with a sculpted-earth amphitheater and possibly adding a footbridge to the Tidal Basin. There are still a lot of ifs with this $100-million project: It has yet to go before regulatory boards, and the Trust hasn’t started fundraising. Renderings of East Mall courtesy of the Smithsonian. West Mall renderings courtesy of Hausman.